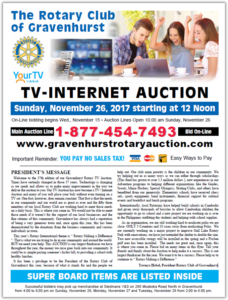 Welcome to the 37th edition of our Gravenhurst Rotary TV Auction. Times have certainly changed in those 37 years. Technology is changing as we speak and allows us to make many improvements in the way we deliver the auction to you. Our TV Auction has now become a TV / Internet Auction and many of you will place your bids from the comfort of your home via internet or phone while watching Your TV. One fact, however, does remain constant. That fact is that the needs in our community and our world are as great as ever and the fifty-three members of our local Rotary Club are working hard to meet those needs on a daily basis. This is where you come in. those needs if it weren’t for the support of our local businesses and the fine citizens of this community. 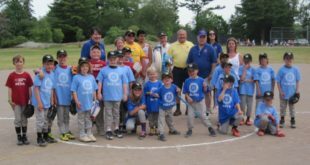 Gravenhurst has always had a reputation for being a very generous town and, once again this year, this has been demonstrated by the donations from the business community and various individuals in town. 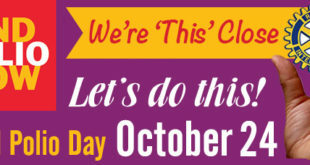 This year’s Rotary International theme is “ Rotary Making a Difference “. That is what we are trying to do in our community and around the world. BUT we need your help. This AUCTION is our largest fundraiser we have throughout the year, the money we raise goes back into our community. It could be as simple paying someone’s hydro bill, to provide a school with healthy lunches. sets, sports equipment, band instruments, financial support for cultural events and breakfast and lunch programs. Internationally, local Rotarians have helped build schools in Cambodia and given away thousands of bicycles to allow Cambodian children the opportunity to go to school and a new project we are working on is over in the Philippines outfitting the students and helping with school supplies. As an organization, we are still working hard to eradicate polio we are close- ONLY 3 Countries and 10 cases away from eradicating Polio. We are currently working on a major project to improve Gull Lake Rotary Park with renovations, we have just extended the shelter to double the size. Two new accessible swings will be installed in the spring and a Frisbee golf area has been installed. The needs are great and, once again, this is where you come in. Please bid on many items in this flyer. This auction has received enormous support from our partners at Your TV. 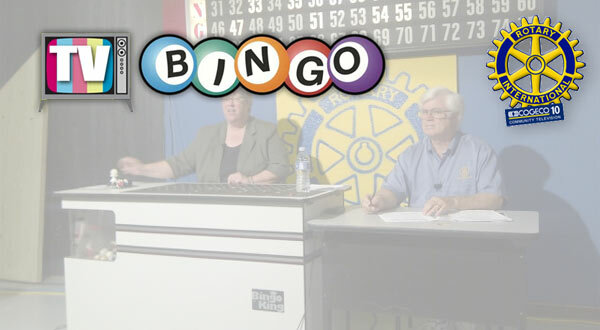 In addition to supporting this annual auction, Your TV airs our weekly Rotary TV Bingo as well. We thank Scott, Sam, Jake, Mel and the volunteers that make Your TV such an amazing community partner.